Remembary is a personal diary app for iOS (iPad, iPhone, and iPod Touch) that enhances your journal writing and reading in innovative and unique ways. It captures your online social media presence, collects photos, calendar events, and GPS information from inside your device - and organizes it all by day to give you an instant context for each diary entry. Remembary also has powerful tools for browsing, searching for, and reading older diary entries. It includes dozens of high-resolution themes and scalable fonts to provide a distinct personal diary experience for every kind of user. Since first launching as an iPad-only app on the App Store in October 2010, Remembary has received rave reviews from notable app review sites as well as from its dedicated users (5 stars overall in Canada and Australia, 4 stars in USA). Remembary 2 is a ground-up rewrite, keeping all the favourite features of earlier versions but adding enhanced graphics, iPhone support, and much more. Remembary was built by Andrew Burke from Shindig Digital Constructions Inc. from Halifax, Nova Scotia, Canada. For media, promotion or business enquiries, please refer to the Support/Contact page on this site. 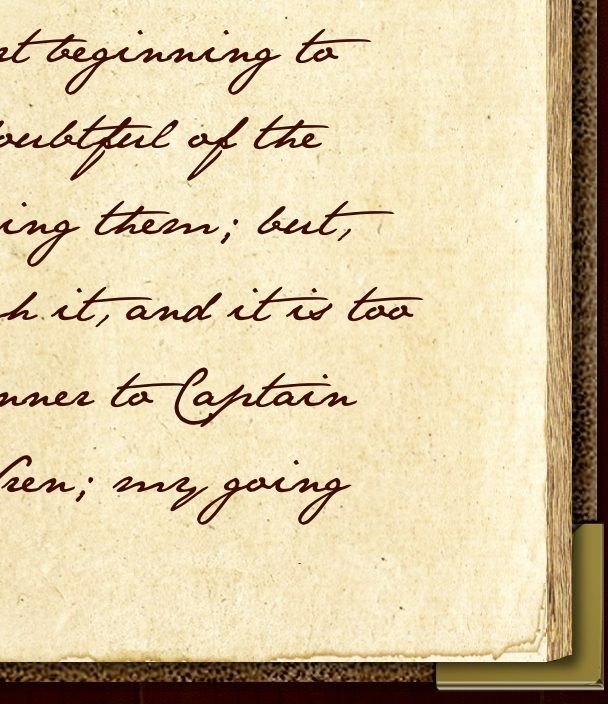 Close-up of the "Codex" theme with the "Jane Austen" font. Click to see a larger version. If you have a large display, this will show the retina iPad version at full pixel-for-pixel resolution. For many people, some of the biggest pleasures in keeping a diary come from using beautiful journals, often with premium paper and fine leather covers. Remembary is inspired by that experience, with themes that recreate antique volumes with aged pages or clean modern journals with textured paper - it takes full advantage of the retina display to show subtle textures and even watermarks. Remembary has a wide range of fonts, from basic serif and sanserif to meticulous recreations of historical handwriting and calligraphic styles - including a reproduction of Jane Austen's handwriting. Remembary's themes fill the whole width of the screen both in portrait and landscape mode, giving you lots of space for reading and writing. When you want to move to another day, drag your finger across the screen to flip the pages of your diary in responsive 3D. Writing in Remembary is as direct as writing in a book: just tap anywhere on the page and start typing. Everything is saved automatically behind the scenes without any extra steps required. An example of Remembary's feeds listing. Tapping on the button to the left of the item copies it to today's diary entry. Tapping on the button to the right shows the item in a web browser. In 2012 we live our lives online. Twitter, Facebook, blogs - we're constantly leaving real-time traces of our day-to-day lives on the internet. Meanwhile, our devices are also capturing and tracking other aspects of our lives, such as photographs and calendar events. All of these pieces are building a kind of real-time automatic record of our days, often with GPS and location information as well. Remembary pulls all of this data together and puts it alongside your written diary, to provide reminders, inspiration, and context for what you write. Each day's entry has a set of three buttons that show the different elements related to that day: items from feeds such as Twitter, Facebook, RSS, or the iOS calendar; images or video from your device's photo library; and a map that shows the positions of any feed items or photos that have GPS information. With a record of what you said online, your scheduled appointments, the pictures you took, and an automatically generated map that shows where you've been, it's much easier to remember what you did each day. 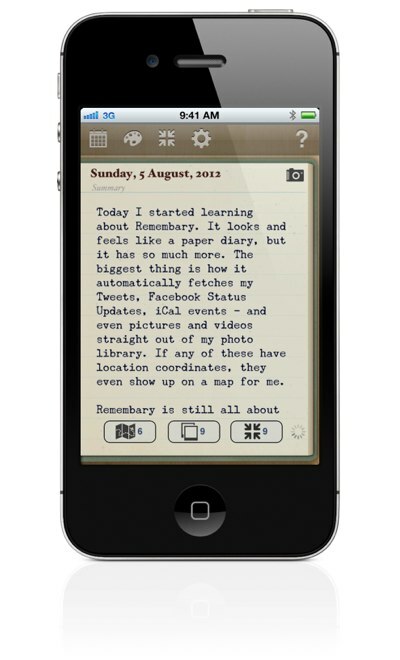 Remembary also uses iOS technology in other ways to improve the diary-writing experience. For example, you can use the new iPad's voice dictation feature to simply speak your diary entry, and it will be transcribed automatically. Remembary also includes a special dark theme that you can use if you're writing your diary late at night and don't want to wake up anybody else. While writing in your diary every day can be a fulfilling experience, the real value of a diary comes when you look back at what you've written before, giving new perspective to both the past and the present. Remembary takes this experience to a whole new level. 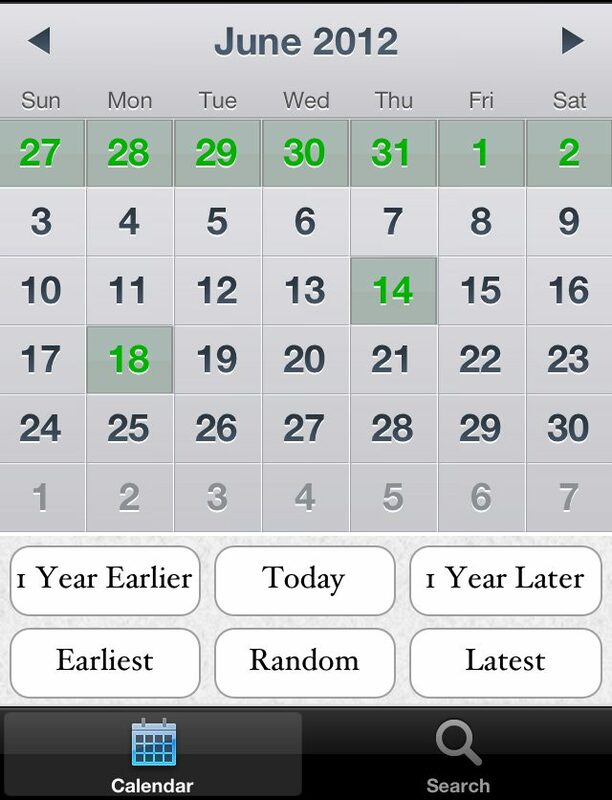 Remembary's calendar interface, where you can see at a glance which days have entries (green) and which don't (grey). The buttons at the bottom provide different ways of jumping around your diary. Click/tap to see in more detail. Your diary is no longer in a set of heavy books on a shelf - instead it's on a device you take everywhere with you. Everything you've written can easily be searched by word or time frame. You don't have to page through old books to find a specific diary entry, and once you've found it you no longer have to decipher your old handwriting. Remembary's calendar interface shows you at a glance which dates have diary entries and which ones don't. It also includes controls for jumping quickly to the very beginning or very end of your diary, as well as one year forward or one year back from the current entry (a really great way to compare how your life has changed over time). There's even a "Random" button that takes you to a completely random diary entry - a fascinating way to experience your past. Remembary also lets you export your diary either as plain text or in a re-importable data format. The plain text version can be entered into a word processing or page layout program and then printed out if you still like having a hard copy. The data format version can be used as a backup copy, or even imported into another device, so you can keep your diary in more than one place. A lot of iOS apps end up becoming "abandonware", given up on by their developers and eventually rendered obsolete after too many system updates. A diary is a big commitment - it is a place where people put their lives, and to which they devote time every day. Paper diaries don't suddenly become obsolete, and neither should a digital one. Remembary is a labour of love, developed by someone who has kept his own journal for many years. I use this app every day, and am dedicated to seeing it continue to be among the best diary apps in the App Store. Remembary has been in the App Store since October of 2010 and has several thousand users. It isn't going away.